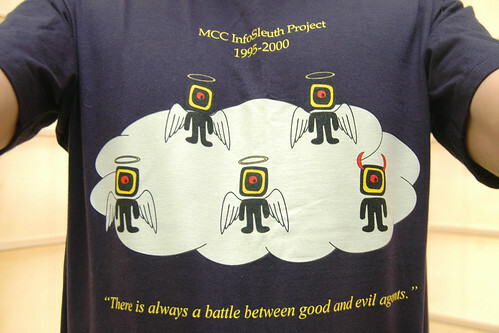 remembering infosleuth and the battle between good and evil agents in The Cloud. mcc developed a variety of “precompetitive” intellectual property and technologies for consortium members who would then take them “in house” for commercialization. one of the technologies developed by mcc was known as the infosleuth agent system which was meant to “provides a unifying framework for selectively and dynamically leveraging and combining fuctionality provided by disparate classes of systems”. three guesses who would be interested in that. the first two don’t count. sure enough one project members was working on a large-scale distributed traffic monitoring system that “was couched as a massive distributed subscription & notification problem”. i was always amusingly fascinated by the similarity between the infosleuth agent icon and the logo for the seminal german industrial band einstürzende neubauten. i was in austin in 2000 when mcc disbanded and the various consortium members heard final project updates. the infosleuth folks made these delightfully creepy t-shirts that gave away the champions of much of the precompetitive infosleuth work. remarkablly prescient, choosing distributed network agents -in a cloud! that was a long time ago, and i’m sure there been lots of work done since then ( e.g. see this ) but the infosleuth page is still up on a site for a wholly owned subsidiary for telcordia ( formerly bell communications research ) which has changed hands a few times over the years but was a mcc member and certainly is no stranger to developing information systems for very special government sponsors. it makes me wonder if there’s some small piece of infosleuth living on in PRISM. Previous Posttech companies concede to surveillance programNext Postnew google glasses co-promotion partner.